Soft light from above illuminates this scene. From left to right: Thomas (also called Didymus), the resurrected Jesus the Christ. 01) (This page) John 20 – Jesus appears to Thomas – Scene 02 – Thomas believes (Version 01). 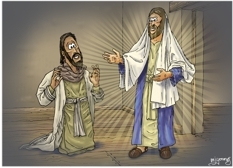 02) (Next page) John 20 – Jesus appears to Thomas – Scene 02 – Thomas believes (Version 02). The only difference between these versions are the radiating light lines coming from the figure of Jesus the Christ in the first one. This is a fairly simple scene. I didn’t want to clutter it up with furniture and irrelevant details. I have simply included a door and walls to establish that this event takes place inside the locked room of verse 26. In fact I have “borrowed” the background from another scene (Mark 16 – Resurrection of Jesus – Scene 07 – Disbelief) and simply flipped it horizontally! I drew the two figures in this scene recently for a lady in the United States, who wanted them on a T-shirt. I thought I’d add the background and upload it as a completed Bible Cartoon. 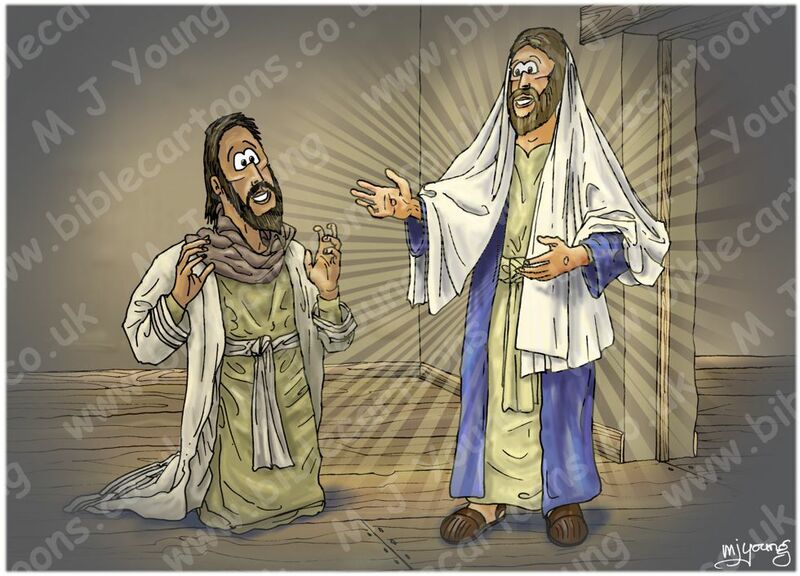 The colours of the figures skin, hair and clothing has long been established in other Gospel drawings I have done.